Cosmic Shimmer Pixie Powder is a mica pearl and dye mix, that when combined with water will create beautiful shimmering colour effects on any porous surface. 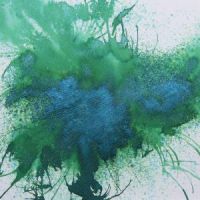 Peacock Green is a stunning blend of deep, rich blues and greens. Each powder can be used on it's own or combined with other colours for even more stunning effects. Sold in a 30ml bottle.